Vitrification is a relatively new form of cryopreservation used to preserve sperm and oocytes. After warming, oocytes are fertilized and the resulting embryos are implanted using assisted reproductive technology (ART). Researchers are the Institut Universitari IVI in Spain recently published a study in the journal Fertility and Sterility revealing vitrification and double vitrification have no effect on the success of implanted embryos. 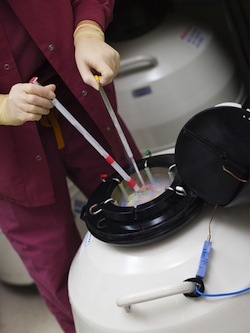 Nearly 800 embryos resulting from vitrified oocytes were warmed in 471 cycles. A control group of nearly 4,400 embryos resulting from fresh oocytes were warmed in more than 2,600 cycles. When researchers compared embryo survival and delivery rates between the two groups the results were not significantly different. Embryo survival rates hovered between 95% and 97% for both groups. Delivery rates were just as close at 34% and 31%, respectively. Conclusion: Vitrification of oocytes, including double vitrification, did not affect embryo survival rates or delivery rates. Source: Cobo A, Castellò D, Vallejo B, Albert C, de Los Santos JM, Remohí J. Outcome of cryotransfer of embryos developed from vitrified oocytes: double vitrification has no impact on delivery rates. Fertil Steril. 2013 Feb 14. pii: S0015-0282(13)00162-3. doi: 10.1016/j.fertnstert.2013.01.106.